A crucial overtake for the lead earned Scott McLaughlin the first win of the Coates Hire Supercars Melbourne 400 ahead of championship rival Jamie Whincup. The race was dominated by the Shell V-Power and Red Bull entries, with Fabian Coulthard and Shane van Gisbergen securing third and fourth respectively. The result sets up an intriguing battle for the remainder of the event, with McLaughlin and Whincup splitting pole positions for the weekend’s remaining three races and a brewing war of words in the paddock over the use of updated panels on the Ford FGX Falcon and Nissan Altima following the debut of the Holden ZB Commodore at the Adelaide 500. “I’m stoked. It was an awesome battle, me and Jamie, we always battle hard and fair – it was so much fun,” said McLaughlin. “The guys did a good job and gave me a great car, and yeah, I’m pumped. Tickford Racing’s Chaz Mostert was best of the rest in fifth, ahead of Scott Pye for Walkinshaw Andretti United who had a significant change of form between the Adelaide and Melbourne weekends. After speaking of his desire to consistently pick up points for a championship charge, David Reynolds secured a low-key seventh place finish ahead of Garth Tander (Garry Rogers Motorsport) and the fast-charging Brad Jones Racing duo of Nick Percat and Tim Slade. The 25-lap race marked the first time championship points had been handed out for the Supercars races at Albert Park, with McLaughlin’s win a historic event 22 years in the making. McLaughlin started from pole position and maintained his lead at Turn 1 while Whincup jumped Coulthard from second position around the outside. The defending champion maintained the outside line around Mclaughlin at Turn 3 but was unable to make a move on the Kiwi. Simona de Silvestro was the first driver to find trouble during the race, initially making contact with Richie Stanaway in the opening laps before a hit to the rear of Jack Le Brocq’s Commodore forced her to pit for damage. “It was a bit crazy. Stanaway was blocking quite a bit, then I saw an opening into Turn 15 and he was trying to pass Le Brocq as well, so just with the speed and having Le Brocq in the middle of the corner didn’t help,” said de Silvestro. Craig Lowndes (Triple Eight) pitted on Lap 5 to take advantage of clear track, with Winterbottom (Tickord) and Davison (23 Red) following the next lap in a move they hoped would pay dividends later in the race. Seeking an undercut during the stops, Whincup was the first to pit of the leading pack on Lap 10, with Pye and Tander following. 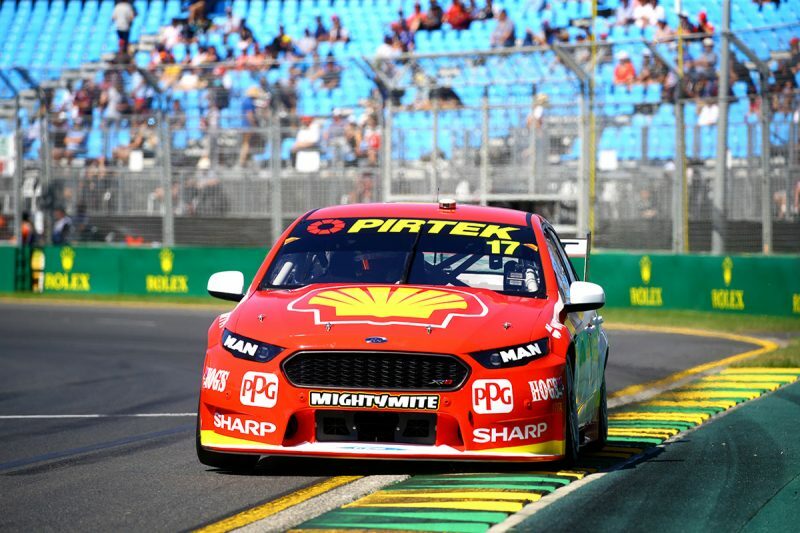 McLaughlin and Mostert pitted on the next tour, with the DJR Team Penske racer dropping the lead to the Triple Eight driver thanks to the seven-time champ’s fresher Dunlop rubber and also what team principal Ryan Story described as a “little mistake” in the pit stop. Emerging in traffic, McLaughlin was then caught behind the slower Commodore of Tim Blanchard (Brad Jones Racing), losing a second to Whincup within a lap. A high-speed three-way battle between van Gisbergen, Mostert and Pye on lap 14 proved a highlight of the 133 kilometre race, with Mostert aggressive in his successful move on the Walkinshaw Andretti United driver. Percat inherited the lead after staying out longer than his rivals but returned to the track in 15th with 11 laps to go. McLaughlin closed the gap to Whincup with 10 laps remaining and the advantage of tyres that were one lap younger. The car #17 driver shadowed Whincup through Turns 1-3 before a side-by-side move at Turn 4 led to the decisive overtake for the leader at the next corner. BJR team-mates Slade and Percat battled for 10th place, with the Holden duo coming close to friendly fire as they scythed through the field. Slade, Percat and Cameron Waters then moved past Lowndes, with the veteran’s early tyre change coming back to haunt him late in the race. Fellow early stopper Winterbottom suffered a similar fate as he would be passed by the same trio one lap later. Whincup would receive the bad sportsmanship flag for exceeding rack limits late in the race, forcing the Holden driver to lower his place in the closing laps and end any chance of a late attack on McLaughlin. A late stop to Davison moved him to 25th overall. Rookie Stanaway had his race ruined as he tried to leave pitlane without his left wheel attached, causing a major delay during the stops. The team was pinged 30 points in the Teams’ Championship and fined $3000 for having a wheel in the fast lane. Race 4 of the Supercars Championship is scheduled for 1240 local time/AEDT.